I've had the redecorating bug for pretty much ever at this point. If you follow me on Pinterest (which if you don't you should) then you know I'm constantly pinning home decor inspo. Recently I've been on the bedroom and office space decor kick. I even have an entire board dedicated to office spaces/desk inspo. It's an understatement to say I'm obsessed. 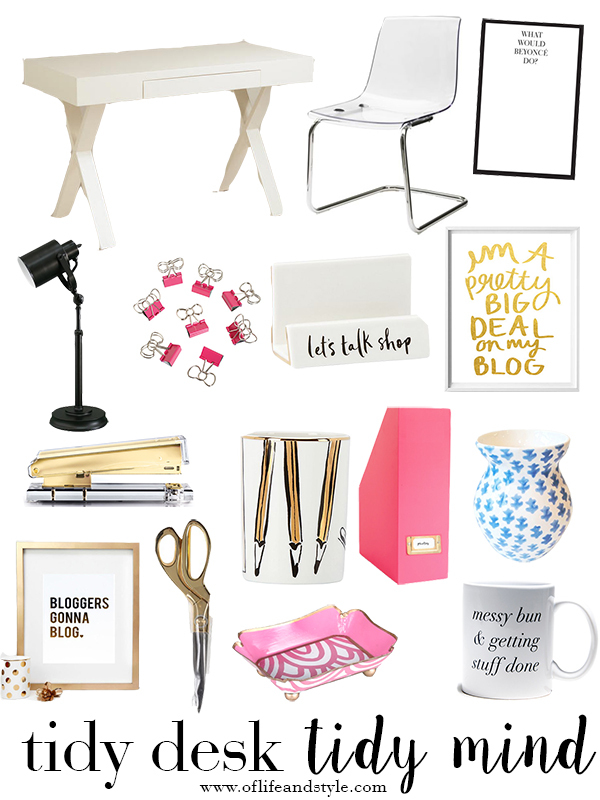 So to virtually decorate I went to the corners of the Internet to compile my perfect office! I love white, pink, and gold. I loved the vase from Design Darling and I think the blue adds a nice pop of color! I need, like NEED the Kate Spade pencil cup and business card holder. Kate Spade has the cutest desk accessories. I also love the mug, print 1 and notepad from Charm and Gumption. I feel like 'messy bun & getting stuff done' is my mantra. #ForRealThough I also love the alternative ghost chair from IKEA. I would spray pant the 'legs' gold to match the rest of my space. I wanna update my desk situation because I feel like when my desk is a mess my life is a mess too. Anyone else? Where do you shop for office/desk accessories? What are your must haves? Leave me a comment below or strike up a convo with me via social media, @samantha_goble! "i never met an office supply i didn't like"